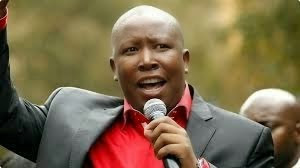 South African politician and leader of the Economic Freedom Fighters Julius Malema has described Nigeria’s president Goodluck Jonathan as an irresponsible leader after he neglected the 2000 people killed in Baga, Nigeria, and commiserated with the killing of 17 people in Paris. The EFF wants South Africa to be involved in military action in Nigeria to take on Boko Haram, following the mass killings and abductions. After the elections last May, Malema dedicated the EFF win of 1.1 million votes to the 200 girls who had been kidnapped in Nigeria and vowed to get them back. He did not make much headway in that mission but now has the crosshairs set on Boko Haram itself. He condemned Nigerian President Goodluck Jonathan for commenting on the terror attacks in France but failing to act on what was happening in his own country. Malema said the EFF would raise this issue in Parliament as military intervention in Nigeria was more necessary than South Africa’s mission in the Central African Republic.